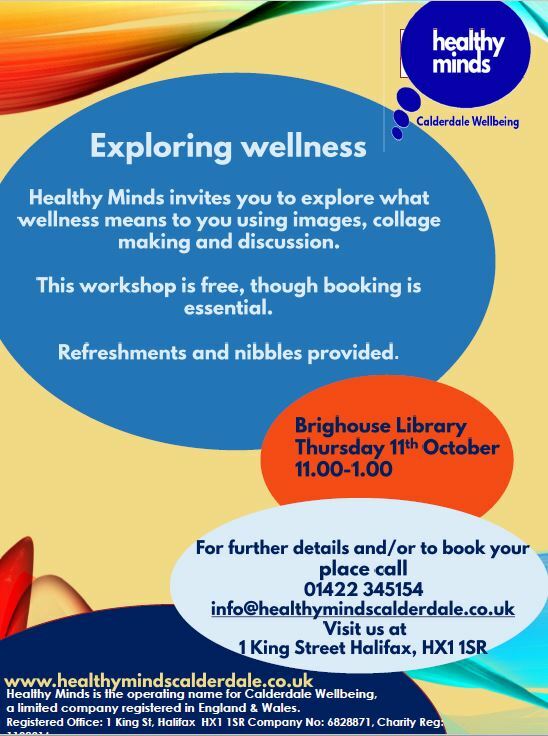 Healthy Minds Calderdale is inviting you to explore your wellness on Thursday 11 October, 11:00am-1:00pm at Brighouse Library. It is a chance to explore what wellness means to you using images and collage making and through open discussion. Refreshments will be provided. The event is FREE but places are limited so please book a place by calling 01422 345154 or by emailing info@healthymindscalderdale.co.uk. This entry was posted in Brighouse, Events, Health, Oct, Staying Well and tagged Healthy Minds Calderdale. Lower Valley Friday Flyer 7 September – OUT NOW! !